Classes are the heart of our program. 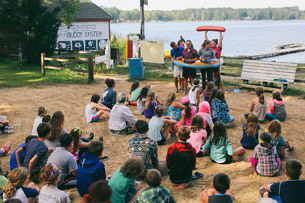 Campers and counselors attend two classes each day, morning and afternoon, taught by VBYC staff. All campers have the chance to try all classes by week's end. Our archery range is on land close to the Riflery range. 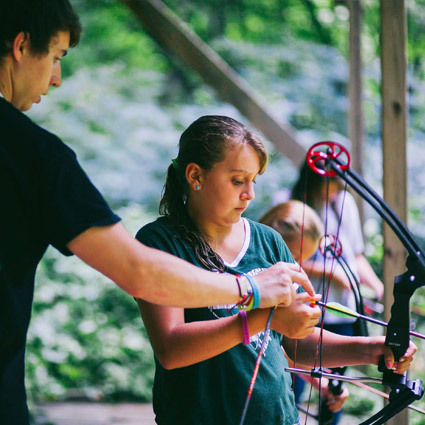 Campers learn proper archery safety and terminology, then develop accuracy when shooting at targets attached to guide wires and some animal targets for the older ones. Archery is often a favorite class. 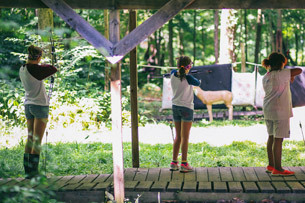 Campers who strike a bull’s-eye or accomplish other noteworthy achievements become members of the famed VBYC Archery Club, one of our esteemed Camp traditions. For an extra challenge during Explorer Camp, we’ve purchased field targets and instruct Archery class at the Upper 20 on the football field. Instructor certification: National Archery Association Level 1 – review of class and safety on site during staff training. 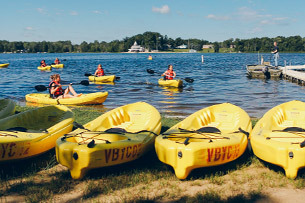 The Canoeing & Kayaking classes begin with a 15 – 20 minute instruction period, Campers learn basic canoeing/kayaking strokes: steering their vessel, working with their partner, keeping the boat level and stable, all with an emphasis on safety. 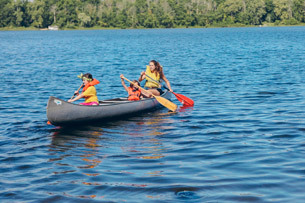 When ready, campers take to the lake- boating as a group, floating near cattails, paddling to the sandbar, all the way to the creek, or out into the middle of the lake. 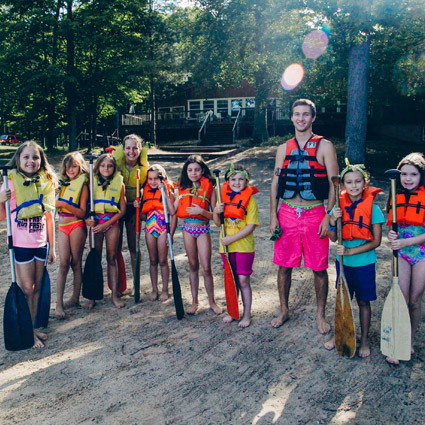 Canoeing and kayaking are always Camp favorites. Campers must be at least a “B” (moderate-level) swimmer to participate. If a camper doesn’t qualify they may choose another class for that period. Canoes & Kayaks are always in visual contact of the waterfront director, who is on shore, with whistles and walkie talkies. VBYC uses one rescue motorboat and a rescue rowboat/kayak for emergencies. This class is an opportunity for cabins to use group problem solving through cooperation, and can really bring campers together. As with all VBYC classes, safety is the first priority. This course can be both physically challenging and a test of will. The challenges are not intended to be solved by individuals. Instead it is necessary for campers to rely on one another to successfully complete each challenge. Campers often surprise themselves when they complete this course. Riflery focuses primarily on gun safety. 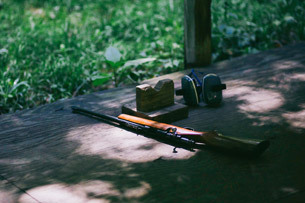 Our rifle range is located on acreage just up the road but separate from main Camp. Many camps no longer teach this course. 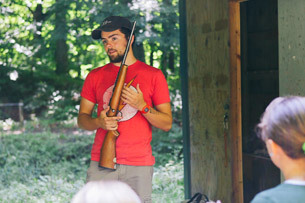 VBYC chooses to keep riflery because it provides campers the opportunity to promote the seriousness of the safe use of guns. Campers shoot from a covered pavilion with a wooden floor, and use .22-caliber rifles to shoot at bull’s-eye targets that hang from a sand mound. The campers are approximately 25 ft. from the target and are not allowed to step off of the covered pavilion. Campers are in the prone position (lying down) during contact with the rifles. 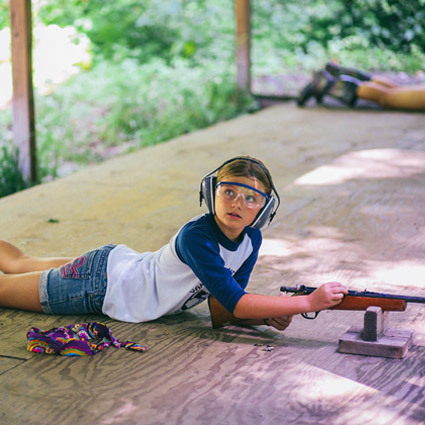 Some campers are not comfortable shooting a rifle, which is fine, as they still learn much about gun safety. 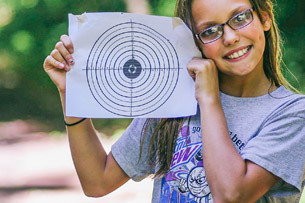 That said we find that most campers think riflery is an awesome class. Instructor training: Trained by certified instructor, class and safety protocols reviewed on site during staff training by local law enforcement gun range specialist. Campers & Staff sing a lot at Camp. 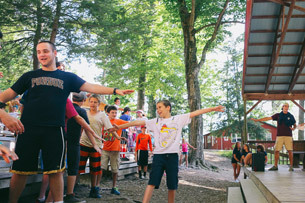 Many songs have been sung at summer camps for generations and some songs are special to VBYC. It’s a great time to learn new songs out of our song book and revisit other songs. 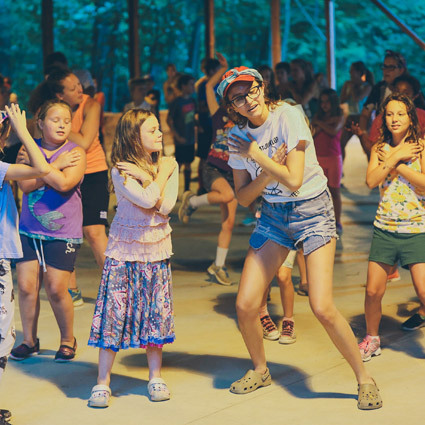 Folk dancing is an important tradition at VBYC, the campers can learn older dances & also create new dances that may become a new VBYC tradition. 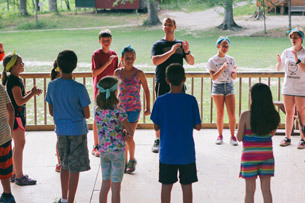 The drama part comes in the form of makeshift skits or plays, improv instruction or other fun camp games. Instructor Certification: Must play an instrument, read sheet music, have theater/improv background, and knowledge of camp songs and traditional folk dances. 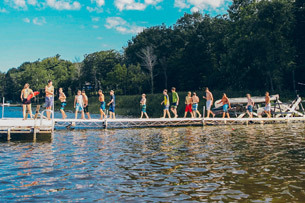 On registration day, all campers have their swim level assessed, and campers are assigned to a swimming area with appropriate depth for their ability. These are called A, B and C water currently. We have chosen to update this class this year to include more challenges and swimming technique taught through creative instruction. During class time everyone learns basic strokes and swim techniques from the swimming instructors. Campers who improve during the week may be promoted to more advanced swim levels. Class is filled with instructions so we make time for free swim daily during choice period. Nature class introduces and encourages children to understand and interact with their natural environment. Our hope is that every child develops a higher appreciation of their impact on the natural world. Everywhere you go at camp there is a critter- from bugs to snakes and frogs, butterflies, birds, deer- we’ve seen deer in the mornings at the beach by our waterfront and in the bowl area in the middle of our cabin row! 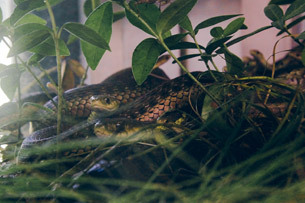 We talk about staying on paths when we’re going from activity to activity for that very reason…if you stay on the paths you’ll still see critters but you can’t accidentally step on a garter snake or toad. We look at trees and plants as well. Water plants and water bugs during the “creekin’ activity” are so fun to watch and investigate. 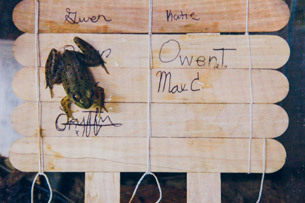 Every camper should be able to recite one kind of bird, tree or plant they’ve discovered at camp. 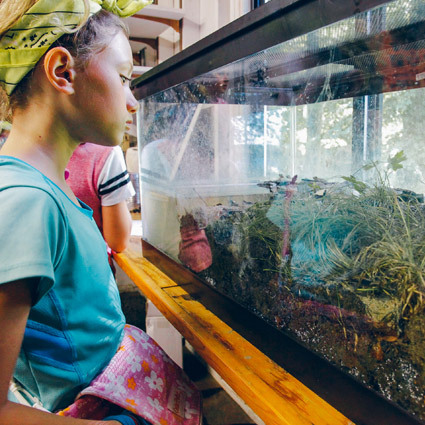 Plenty of opportunities to challenge the outdoorsy kids with looks into invasive aquatic plants, microscopes to look at lake water quality, or even orienteering games! Crafts at camp are so much fun. So many ways to work nature and the outdoors into your crafting. Our Crafts Instructor comes loaded with ideas for unique ways to help kids express their artistic side. 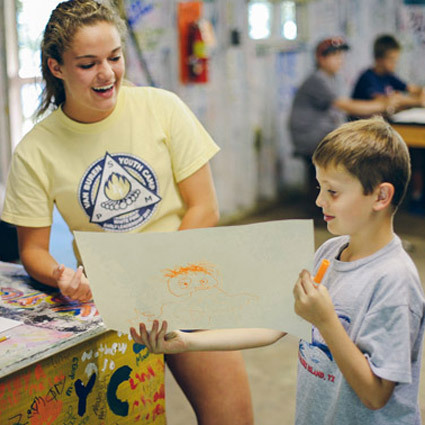 From traditional camp crafts like lanyards and god’s eyes, to drawing and painting, to candles in the sand. Who knows what each day will bring? The Craft House is a favorite place for kids to hang out during choice time. The outdoor porch allows for drawing nature by observation and is a great place to soak up some quiet time. On the far side of Main Camp, the Craft House offers a bird’s eye view of most of that piece of property.